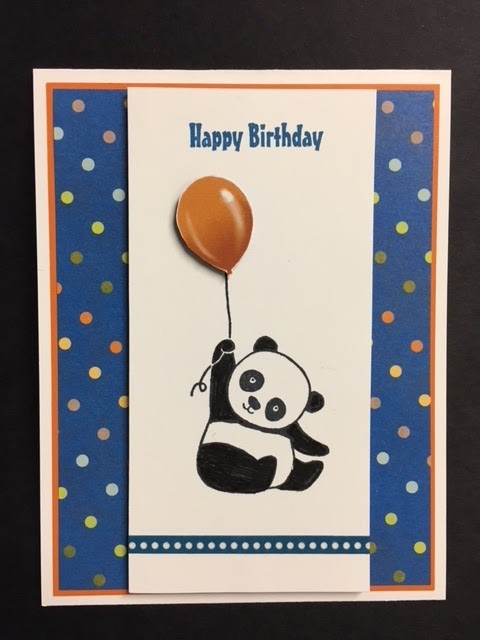 I found a fun card using the "Party Panda" set and I thought I would see what papers I could gather to make a fun festive children's birthday card. You can see the original here. This is what I came up with. I didn't have the same background paper or the same Washi tape. My background paper is from the 12" x 12" "Birthday Memories" Decorative Series Paper (DSP) pack. This is a very fun and simple card to make. The base of my card is a folded half-sheet of Whisper White. Then I added a 4" x 5-184" piece of Pumpkin Pie card stock on top of that. Then the DSP was cut 3-7/8" x 5-1/8" and was taped on top of the Pumpkin Pie card stock. The focal strip was cut 2-1/2" x 5-1/8". I stamped the bear and left room for some Washi tape. Then I stamped the words from the "Party Panda" set using Pacific Point ink. I set this panel in place using Dimensionals. The balloon was from the "Birthday Memories" DSP. I just fussy cut one out and set it in place using Dimensionals. And that was it. I told you it was fun and simple!! Oh and pretty quick too!